The smartphone has transformed your life by keeping you always connected. But it is also an extremely powerful computer that happens to always be with you, and can now be used to bring the latest high-tech systems to your old car. Like an aftermarket backup camera. 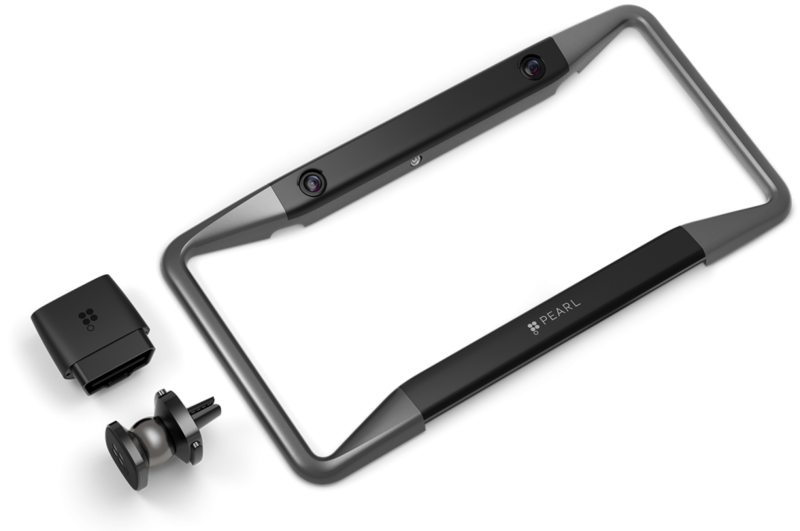 RearVision by Pearl Automation is a new aftermarket backup camera system that consists of a license plate frame, an OBD (on-board diagnostics) port adapter and a smartphone app and is a 100% wireless. Together, they give you a backup-camera and obstacle-alert solution that is easy to install and use. A simple tool helps you install and lock the license plate frame in a few minutes. The frame has its own solar cells to power the two HD cameras, so you don’t need to worry about batteries or an electrical connection. The OBD port adapter plugs into the OBD port of your car, which is below the steering wheel or dashboard and became a required feature on all cars built and sold in the U.S. after January 1st, 1996. Install the “Pearl Auto” app on your iPhone or Android phone, and you are done! The two HD cameras provide excellent clarity and wide angle views, and also work well at night. The RearVision is different from other smartphone-based backup camera systems on the market in that it uses the microprocessors in the adapter and your smartphone to enable valuable driver-assistance features. For example, the car adapter analyzes the stereo video streams from the cameras and performs advanced image processing to identify obstacles (like wall corners) and surprises that are behind you. It then provides visual and audio alerts on the RearVision app, so you can avoid these obstacles and surprises. The entire system is also built to deter theft. The cameras are paired with the adapter at the factory, and then to the app when you first launch it. So if the license plate frame is stolen, it is rendered useless. Also, Pearl Automation will send you a new frame at no charge if yours does get stolen. The RearVision aftermarket backup camera system is priced at $499, and can be pre-ordered HERE. Shipments start in September 2016.